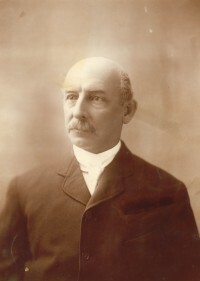 Edwin Gilpin, the grandson of author Thomas Chandler Haliburton, was a mining engineer, Commissioner of Mines for Nova Scotia, and a prolific author of scientific reports and articles. Gilpin was an active member of the Nova Scotian Institute of Natural Science (forerunner of the present day Nova Scotian Institute of Science), for which he wrote some 26 papers, primarily on mineralogy and geology; he served as President of the Institute for the years 1895–97. He was elected fellow of the Geological Society of London in 1874. In 1882 Gilpin became a founding member of the Royal Society of Canada. Photo of Dr. Edwin Gilpin, Jr., (Elite Studio) used by permission of Nova Scotia Archives and Records Management [NSARM].